Preparing preservice early childhood teachers to teach about Nature of Science (NOS) in their science lessons can provide challenges to the methods course instructor. Early childhood science methods course instructors generally agree that early childhood preservice teachers enjoy using children’s literature in their instruction. Preservice teachers can write and design children’s books that can help them to not only refine their own understandings of NOS aspects, but also to consider how to introduce these ideas to young children through their stories. These stories can support the teaching of NOS through hands-on activities in the classroom. 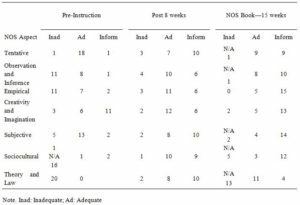 The authors tracked a class of early childhood preservice teachers over the course of a semester to determine their ideas about NOS and their depictions of NOS in a storybook they designed for young children. The authors determined whether these NOS ideas were depicted accurately and in a way that could be conceptualized by young children. It was found that nearly all of the preservice teachers were able to portray the NOS aspects accurately through their stories, and that not only did the stories hold promise of introducing these NOS ideas in an engaging manner for early childhood students, but the preservice early childhood teachers also refined their own understandings of NOS through the assignment. An appropriate understanding of nature of science (NOS) is considered important for reform efforts in the USA, and is highlighted in the Next Generation Science Standards (Achieve, 2013). Studies have shown that preservice and inservice early childhood teachers can develop strategies for emphasizing NOS that improve student understandings of NOS (e.g. Conley, Pintrich, Vekiri, & Harrison, 2009; Deng, Chen, Tsai, & Chai, 2011, Khishfe & Abd-El-Khalick, 2002). Teachers have called for support through different strategies they can use in their classrooms (Akerson , Pongsanon, Nargund, & Weiland, 2014). 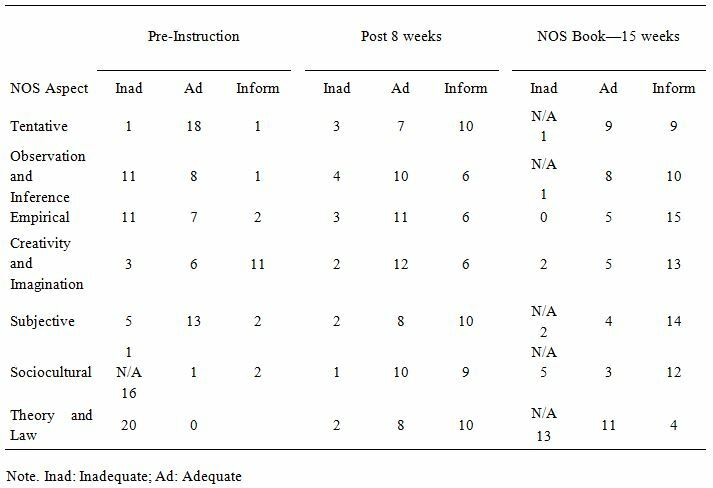 Akerson, et al (2011) has found that using children’s literature is one effective strategy for emphasizing NOS to elementary students. Additionally, preservice early childhood teachers are often more excited about children’s literature than science, and so using children’s books within science methods courses can help preservice early childhood teachers improve their experiences within science methods and see how their strengths and interests in literature can connect to science instruction (Akerson & Hanuscin, 2007). It has been the first author’s experience in teaching early childhood science methods that early childhood teachers are excited about using children’s books to support their NOS and science teaching. However, these same preservice teachers have been frustrated that they were unable to find a children’s book that would introduce the NOS aspects they wish to teach at early grade levels. The instructor believed that a good way to support the preservice teachers in both their understandings of NOS, and their wishes to teach it to their early childhood students, that the teachers could be supported in developing their own children’s books to use with their students. In this case, a course assignment was designed to help preservice teachers conceptualize how to transfer their knowledge about NOS to early childhood students through a children’s book they designed. 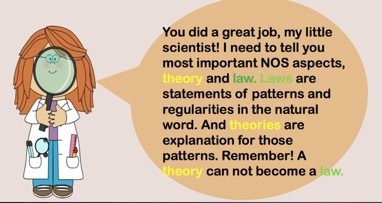 Based on the NSTA (2000) position statement for what teachers should know about NOS and what they are responsible for teaching their own students, the course instructor emphasized the following NOS aspects in her class: (a) scientific knowledge is both reliable and tentative (we are confident in scientific knowledge, yet recognize claims can change with new evidence or reconceptualizing existing evidence), (b) no single scientific method exists, but there are various approaches to creating scientific knowledge, such as collecting evidence and testing claims, (c) creativity plays a role in the development of scientific knowledge through scientists interpolating data and giving meaning to data collected, (d) there is a relationship between theories and laws in that laws describe phenomena and theories are scientific knowledge that seek to explain laws, (e) there is a relationship between observations and inferences with inferences being interpretations made of observations, (f) although science strives for objectivity there is an element of subjectivity in the development of scientific knowledge, and (g) social and cultural context plays a role in development of scientific knowledge, as the culture at large influences what is considered appropriate scientific investigations and knowledge. To ensure that the preservice teachers held sufficient NOS content knowledge we measured their conceptions of NOS using the VNOS-B (Lederman, Abd-El-Khalick, Bell, & Schwartz, 2002), and also again midway through the semester, and again at the end, to determine sufficient content knowledge and to determine whether thinking about how to teach NOS to young children may influence their own ideas. The VNOS-B does not explicitly ask about the existence of a single scientific method, but does include the empirical NOS, meaning that scientific claims and development of scientific knowledge requires empirical evidence and data. The table below shows their changes in NOS conceptions over the semester. For the storybook project, the instructor asked preservice teachers to introduce all NOS ideas except the distinction between theory and law, as that is not in the early childhood curriculum. Previous research has found that early childhood preservice teachers and their students can conceptualize these NOS ideas, (Akerson & Donnelly, 2010), and therefore we believed that including them in a children’s book would be a good way to introduce these NOS ideas to young children. The first author was the instructor of the course, and kept a teacher/researcher journal throughout the course. The other two authors aided in ensuring the instructor was teaching NOS using explicit reflective instruction by observing each class session, taking notes of student engagement and NOS instruction, as well as photographing students working, and in analyzing effectiveness of the development of the books and instruction using the data collected as a team. The project was introduced at the beginning of the semester long methods course as something the preservice teachers would work toward completing as a final “exam.” Indeed, the project replaced the final exam period for this section, and instead the preservice teachers had a book-share where the preservice teachers shared their books with the rest of the class. The NOS elements that were targeted in this project and were to be included in the book are the tentative but reliable NOS, the creative NOS, the distinction between observation and inference, the empirical NOS, the sociocultural NOS, and the subjective NOS. These NOS ideas were included because they lend themselves to connections in the early childhood curriculum, and have been previously found to be accessible to young children (Akerson & Donnelly, 2010). To prepare the preservice teachers to develop such a book, the instructor needed to make them aware of ideas about (a) NOS, (b) elements of children’s books, and (c) the technology they could use to aid them in their design. As is common in the practice of the course instructor, NOS was a theme in the methods course, and NOS was included explicitly in each class session, and debriefed in the context of science content that was explored as examples of instructional methods for early childhood students. The instructor modeled how to explicitly debrief for NOS conceptions each week. For example, during an investigation that included an exploration of Oobleck and whether it is solid or liquid, the instructor modeled questions to ask students regarding NOS during the debriefing to ensure explicit connection to NOS. One such question connected “subjectivity” or the background knowledge that scientists bring to a problem. The instructor asked the preservice teachers to think about how scientific subjectivity could be highlighted through this exploration. The instructor asked “what could the scientists do when they found this substance that did not fit into either classification?” A discussion followed regarding that if scientists understand solids, and understand liquids, then they would realize that this substance has components of both. The discussion ensued that it would therefore it would be difficult to categorize into one or the other. The instructor led them to realize that it was scientists who create the categories of matter, through empirical evidence and creativity. The instructor therefore helped the preservice teachers come to the realization that scientists are also creative, that they could create a new category into which they could classify the Oobleck. The instructor used explicit reflective NOS instruction to help them make a connection beyond simply teaching the distinction between observation and inference through this activity, they could connect other NOS aspects, such as subjectivity and creativity. Such activities and NOS debriefings took place on a weekly basis during the science methods course. The discussion continued with preservice teachers reflecting on how to use similar activities with young children. The instructor shared that this activity could be used as an assessment and instructional sequence for not only young children’s understandings about characteristics of solids and liquids, but also for how scientists are creative scientifically, in terms of “creating” new categories for matter, and how scientists use evidence, observations and inferences, and how claims are tentative given they can, and do, create new categories based on evidence. Additionally, given students’ prior knowledge about characteristics of solids and liquids were used to determine characteristics and identity of the new substance, conversation surrounding the importance of background knowledge, and subjectivity of scientists can occur between the teacher and students. 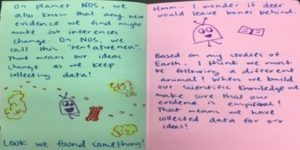 The science methods instructor spent time in the methods course using children’s literature to both launch and support science activities as an example for how to use such books to emphasize NOS with children. For example, the instructor read the Skull Alphabet Book (Pallotta, 2002). In this book the reader sees an illustration of a skull, reads clues, and tries to infer the animal the skull would be from. There is a different skull from A to Z. Using this book is an example of decontextualized NOS instruction (Bell, Mulvey, & Maeng, 2016; Clough, 2006), if the instructor makes explicit connections with the preservice students. The instructor led a discussion with the preservice teachers for how this book could be used to explicitly illustrate NOS elements to elementary students. For instance, the elementary students could be asked which NOS elements are illustrated in the book-to which they could respond “Observation and inference” (observing the skull and reading the clues, and inferring the animal), “creativity” (creating an idea of what the animal might be from the evidence), “subjectivity” (one would not infer an animal that one had never heard of before), “empirical NOS” (making inferences from data), “social and cultural NOS” (one would be more likely to infer an animal from the culture they are from), and “tentativeness” (one can infer an animal and be likely correct, but never be certain because it is a skull and without seeing the living animal it is not certain). While the instructor shared this book with the preservice teachers she explicitly pointed out these ideas about NOS that could be connected to the book for children. These kinds of discussions and book debriefs were held weekly over the course of the semester, connected to children’s books as well as science concepts. Following the use of the children’s book in introducing science concepts, the preservice teachers could think about engaging elementary students in science activities and investigations and reflecting orally or in writing how what they were doing was similar to the work of scientists. For example, preservice teachers could distribute fossils to their elementary students, asking them to make observations and inferences about the whole organism and its likely habitat. The elementary students could be asked to infer and draw the remainder of the organism and its habitat. A debriefing discussion could take place where elementary students could discuss how their inferences came from observations of the empirical data—the fossil, how they used their background knowledge (subjectivity) to make their inferences, and how their ideas about what the fossil was from might change if they had more information. Additionally, elementary students could discuss how scientists create ideas from the evidence, as they did, and how these creations would be consistent with what they are familiar in their own social and cultural contexts. The course instructor also shared a variety of children’s books with the preservice teachers. These samples of children’s literature books varied from non-fiction to fiction, and were used to explicitly share components of children’s picture books. Features that were highlighted were (1) strong characters, (2) a story that teaches (in this case, the story would teach NOS), and (3) interesting and clear visual drawings or representations of the story. The books that were created by the preservice teachers were mostly very well done in terms of introducing NOS aspects to young children. There were a total of 22 preservice teachers in the class, all female. Ten preservice teachers connected their NOS books to popular characters from children’s media (e.g. SpongeBob Squarepants and the Case of the Missing Crabby Patty) or books (e.g. The Pigeon Does an Investigation). Ten preservice teachers created their own stories from scratch (e.g. Marcy Meets the Dinosaurs). Two did not consent to have their books used as examples, so they are not included. Therefore the preservice teachers were free to either modify an existing story, which aided in identifying illustrations as well as a storyline, or to create their own to illustrate NOS. Half of them did select to modify an existing story, which enabled them to embed NOS elements into a story that already existed, freeing them to consider how NOS may fit into a story already suitable for young children. As a methods instructor, it is important to help the preservice teachers consider ways to transfer their understandings of NOS to young children through the text. It was a difficult point for some to think about, and to consider how to phrase sentences to accurately portray NOS, but in a way accessible to children. Using feedback loops this process became more streamlined, where preservice teachers provided feedback to one another. Of the twenty books submitted, all but three included all NOS aspects accurately depicted. Three books did not include subjective or sociocultural NOS. One book also did not include tentative NOS or the distinction between observation and inference. Of the aspects that were included, all but one preservice teacher included accurate representations. Though not required, five preservice teachers included the distinction between theory and law in their children’s books. While it is clear that simply an accurate presentation of NOS ideas is not sufficient to teach NOS to young children, it is a starting point for the preservice teachers to have an accurate representation of the ideas to begin their teaching, which of course, would require explicit-reflective NOS instruction (Akerson, Abd-El-Khalick, & Lederman, 2000). Use of these children’s books would require that the preservice teachers make explicit reflective connections while sharing with young children. We reviewed the children’s stories created by the preservice teachers to determine whether the NOS concepts were included accurately. All authors conducted a content analysis on the accuracy of the NOS aspects that were incorporated in the stories. The authors also used the NOS children’s books to determine the preservice teachers’ NOS conceptions at the end of the semester. These sources of data were reviewed independently and then compared to ensure valid interpretation of NOS conceptions both within the books and conceptions held by the teachers themselves. The teacher/researcher log and field notes were used to further triangulate interpretations of the data. How Well Do Children’s Books Include NOS? It was clear that preservice teachers not only improved their NOS conceptions over the first eight weeks of the semester, but also during the last seven weeks when they were developing the books to use with their own future students, and to share with their classmates. Below we now share samples of how the preservice early childhood teachers included the various NOS aspects in their stories, by NOS aspect. Eighteen students were readily able to incorporate the tentative NOS into their stories in a way that they could share this characteristic of NOS with their own students. All of the stories included a scientist or a character in the story revising an inference based on new evidence or the reinterpretation of existing evidence, and making a new claim. In all stories the story included this idea as part of science, and not that the scientists were “wrong” with their earlier inference. Figure 1 (Click on image to enlarge). Sample of tentativeness in storybook. In other stories there was a more direct description of the tentative NOS. For example, Sophia’s story (see above) was set within an alien culture, and began with the lead character saying “ Hi my name’s Meep and I come from the planet NOS. On planet NOS, we live by set of rules called Nature of Science.” She continues her story showing illustrations that Meep is visiting earth and tell people how they use aspects of NOS. The image above is presenting tentativeness of science. 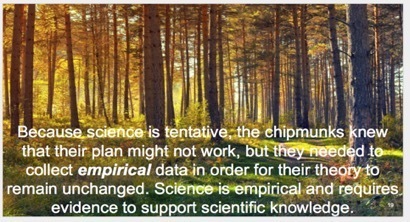 Though her idea is not technically “correct” in that NOS is not a set of rules to live by, nor do ideas “constantly change as we collect data,” it is still along the right track in helping younger children realize that science is not “set in stone” and scientific claims are subject to change. Figure 2 (Click on image to enlarge). 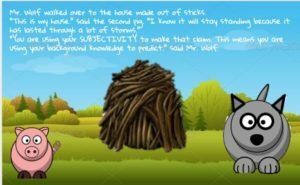 Sample of observation and inference in storybook. In this particular example, the author was able to make a connection where the reader would learn about observations and inferences as data were observed, and then could later connect to the tentative NOS as the claim changed with more evidence as further reading of the story showed the ideas changed and tentativeness was connected. All twenty books included accurate depictions of the empirical NOS. In each case the main character, often a scientist, needed to collect data to solve a problem or make observations. Olivia wrote an original story about the lives of three chipmunks in a forest. In the story the chipmunks are keeping safe from hawks, and are doing a scientific exploration in the forest to determine how they are remaining unseen by the hawks. Their exploration leads them to understand camouflage. Olivia uses following example to show science is empirical, as she also connects it to the tentative NOS. 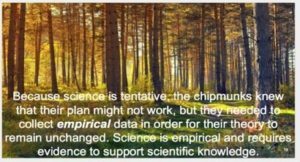 The chipmunks had their own personal “theory” for why the hawks were not able to see them, but changed their ideas as they collected new evidence through empirical data. Figure 3 (Click on image to enlarge). Sample of scientific tentativeness in storybook. While this story above is accurate in terms of NOS, it is also the case that the writing was at a level beyond what K-2 students could read on their own. This book would need to be a read-aloud by the teacher to the students, and would likely require much teacher input to help young learners accurately conceptualize the content. Therefore it would be necessary to aid preservice teachers to consider thinking about the reading level and vocabulary for independent reading, which appeared to be difficult for some preservice teachers. Eighteen of the stories included accurate representations of creativity and imagination in the development of scientific knowledge. Ava introduces and immerses well the aspects of NOS in her storybook about Pinocchio. 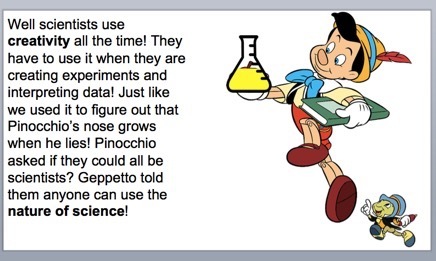 In the book, Pinocchio tries to figure out why his nose is growing using scientific inquiry, and through that inquiry the elements of NOS are illustrated. Through her story she would be able to share with her early childhood students that scientists are creative in interpreting data as well as creating investigations, and in this case in her story, in creating a way to figure out that Pinocchio’s nose grows when he lies. It was clear through her story that those who use science are creative, and that aspects of NOS are part of scientific inquiries. Figure 4 (Click on image to enlarge). Sample of scientific creativity in storybook. Eighteen stories included an accurate depiction of the subjective NOS, in which scientists’ own backgrounds influence their interpretations of data. In the stories it was usually the case that the scientific claim was shown to be made partially through the understandings of the scientist or the one doing the investigation. Mia used characters from a popular children’s story The Three Little Pigs, to teach NOS elements throughout the story. In her story the main character Mr. Wolf guides the three little pigs to act as scientists as they try to figure out whether their houses are sturdy enough to withstand the hurricane. Through these characters, Mia illustrates that scientists are subjective, and use their background knowledge in making scientific claims. As we can see from the excerpt from her story, she clearly illustrates the pigs’ subjectivities helps in making scientific claims. Figure 5 (Click on image to enlarge). Sample of the role of subjectivity in storybook. Fifteen of the stories included accurate depictions of the influence of sociocultural mileu on scientific claims. In some of the books, such as Sophia’s story from the alien perspective, the clash of different cultures was used to illustrate the influence of sociocultural aspects on scientific claims. In other books, such as the one by Isabella, there is a learning sequence where a character develops an understanding of the role of culture. In Isabella’s particular story a child named Mary meets a paleontologist (Dr. Jenkins) at a science museum. 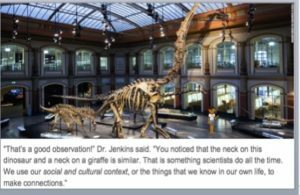 Mary has an adventure at the science museum, and learns that scientists (and other people) interpret data through the culture in which they live. Mary learned from Dr. Jenkins that her own inference that a dinosaur’s long neck was like the dinosaur’s came from her social and cultural context. Mary learned that because if she were in a culture without knowledge of giraffes she would not have inferred that similarity. Figure 6 (Click on image to enlarge). Sample of sociocultural context in storybook. Again, though not required to include the distinction between theory and law in their stories given it is not in the early childhood curriculum, five preservice teachers did find ways to incorporate theory and law into their stories in accurate ways. Emma included it in her story of the mother scientist teaching her son about science and NOS. She was one of the few preservice teacher authors who also incorporated the idea that theories never become laws. The others who included theory and law in their stories were clear that theories were explanations for patterns in data that determined laws. It was good to see that there were several who included theory and law—this was the most difficult aspect for the preservice teachers to gain good understandings of as well. Figure 7 (Click on image to enlarge). Sample of theory and law in a storybook. All preservice teachers shared their books with each other at the end of the semester in a book share. In addition, the preservice teachers uploaded electronic versions of their books to a course website that could then be accessed by the course instructor, and electronic copies shared with all students in the class. The course instructor used the criterion sheet shared earlier to review the books for the required elements prior to the book share. Each week after the assignment was introduced there was time to discuss questions or concerns regarding the development of the books. Some preservice teachers indicated a difficulty in conceptualizing an original story, which is when the idea came to take an existing story and revise as a NOS story. An important component was the inclusion of engaging characters and an interesting story that would teach about NOS, not necessarily a story with original characters. However, some preservice teachers designed their own characters and storylines. In one case, the instructor required a preservice teacher to revise the book prior to sharing as the information was not complete. The books were well received by their peers, and the book sharing had an air of both professionalism, as the preservice teachers were considering how best to aid their own students in conceptualizing NOS, and also “fun,” as it was energizing and fun to see and listen to the stories that were created by the preservice teachers in the class. The preservice teachers indicated that the assignment seemed valuable to them, as it was something they could take with them into their student teaching, and into their classrooms when they became teachers. They provided feedback to one another during the book sharing, suggesting some wording changes, as well as reinforcing the accuracy of portrayal of NOS ideas when it was needed. It was clear that developing the books helped the preservice teachers think about how to introduce NOS ideas to their elementary students. This focus on ways to portray NOS ideas to elementary students influenced the preservice teachers in refining their own NOS understandings as well as about how to transfer understandings to students. The preservice teachers held good understandings of NOS as evidence by their portrayal of NOS concepts to young children through the story they created. It seems clear to us that designing the children’s books to teach about NOS to their students helped the preservice teachers consider ways to teach NOS to their own students, while continuing to refine their own understandings about NOS. We recommend the use of literacy to teach about NOS, which seems preservice teachers are very excited to include in their classrooms. Akerson, V. L., Abd-El-Khalick, F. S., & Lederman, N. G. (2000). The influence of a reflective activity-based approach on elementary teachers’ conceptions of the nature of science. Journal of Research in Science Teaching, 37, 295-317. Akerson, V. L., Buck, G. A., Donnelly, L. A., Nargund, V., & Weiland, I.S. (2011). The importance of teaching and learning nature of science in the early childhood years. The Journal of Science Education and Technology, 20, 537-549. Akerson, V. L., & Donnelly, L. A. (2010). Teaching Nature of Science to K-2 Students: What understandings can they attain? International Journal of Science Education, 32. 97-124. Akerson, V. L., & Hanuscin, D. L. (2007). Teaching nature of science through inquiry: The results of a three-year professional development program. Journal of Research in Science Teaching, 44, 653-680. Akerson, V.L., Pongsanon, K., Nargund, V., & Weiland, I. (2014). Developing a professional identity as a teacher of nature of science. International Journal of Science Education. 1-30. Akerson, V. L., Weiland, I. S., Pongsanon, K., & Nargund, V. (2011). Evidence-based Strategies for Teaching Nature of Science to Young Children Journal of Kırşehir Education, 11(4), 61-78. Bell, R. L., Mulvey, B. K., & Maeng, J. L. (2016). Outcomes of nature of science instruction along a context continuum: preservice secondary science teachers’ conceptions and instructional intentions. International Journal of Science Education, 38(3), 493-520. Clough, M. P. (2006) Learners‘ responses to the demands of conceptual change: Considerations for effective nature of science instruction. Science Education, 15, 463-494. Deng, F., Chen, D., Tsai, C., & Chai, C. (2011). Students’ views of the nature of science: A critical review of the research. Science Education, 95, 961-999. Khishfe, R. & Abd-El-Khalick, F. (2002). Influence of explicit and reflective versus implicit inquiry oriented instruction on sixth graders views of the nature of science. Journal of Research in Science Teaching 30(7), 551-578. National Science Teachers Association. (2000). NSTA position statement: The nature of science. Document Retrieved December 8, 2008. http://www.nsta.org/159&psid=22. NGSS Lead States. (2013). Next generation science standards: For states by states. Washington, DC: National Academies Press. Pallotta, J. (2002). The Skull Alphabet Book. Charlesbridge: Watertown, MA.